I’m excited to be sharing the third part in my bedroom decor inspiration series today! After spending time on cottage style and farmhouse style inspired spaces, I’m focusing in on some French Country bedroom inspiration. I love this style because it is filled with lovely neutrals, lush decor and textures, and of course, amazing antiques. The French Country style can also be quite versatile. It really can run the gamut from rustic to refined, or anywhere in between. You’ll notice in the examples I selected for this post that each room has its own unique feel, even though they are all inspired by the French Country style. At the end of the post, you’ll also find some of my shopping suggestions (including a really beautiful Anthropologie mirror that is NOT budget-friendly, but I couldn’t resist). Oh my, this space. Please click over and check out some of the amazing diys that accompany this gorgeous room. A lot of the finishes you see here are diy projects. In fact Cindy and her husband even created their own custom built-ins that look so amazingly authentic I was shocked when I realized they were a diy. Go check it out. Serious house goals right there. And guess what? They also covered their popcorn ceiling with that lovely planking. What a great way to transform a typical ceiling into a work of art. Also, how pretty is the trio of mirrors above the bed? A perfect way to showcase some antique finds. 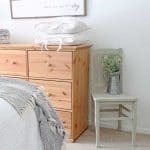 I feel like this is one of those bedrooms that everyone repeatedly comes across on Pinterest or Instagram because it is just so popular and beautiful! I love how Brittany brought in French elements, but blended styles in her own way. 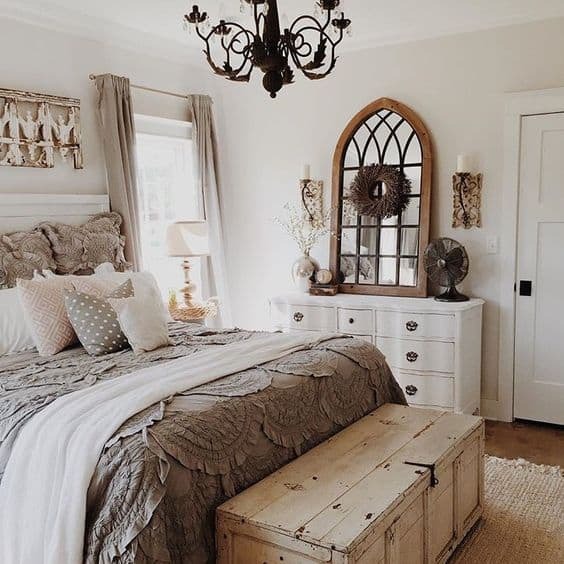 The provincial dresser and the lush bedding give the room a romantic air that is tempered with the more rustic trunk at the end of the bed and the farmhouse-y fan on the dresser. This is also a great study on how to use deep colors without making a room feel dark. Sometimes it’s tempting to keep everything light (especially if you don’t have natural light from windows), but the deeper colors and wood tones in this room really ground the space and give it life. 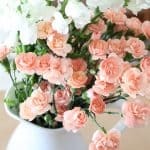 For those of you with a more modern aesthetic (or with spouse who would prefer to avoid an overly romantic or feminine space! ), this is a great inspiration space for blending styles. The pretty floral throw pillows are a nice pop of color and charm, while the accents from the mirror and nightstands give the room a lavish feel. And another thing? This room is a great example of how to make a ceiling fan work with your aesthetic! Not always the easiest thing to do, am I right? There are so many pretty neutrals (mainly variants of white) in this space, but the textures and layers give it plenty of visual interest. Lots of white on white on white here! Some things I’m loving? The beautiful chandelier and that ginormous bedspread. I love how it sweeps the floor. If you’re starting from scratch with your French Country look, here are some of the decor keys I suggest focusing on as you transform your room. Start with a nice neutral paint color and then dive into some of these updates to transform your space. 1 – Statement bed – choose a headboard or bed frame that sets the tone for the room. Consider an antique frame, a rustic reclaimed wood headboard (maybe whitewash the wood), or a tufted headboard. 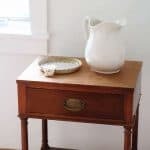 2 – Heirloom antiques & chippy furniture – Use lots of family heirlooms or junk market finds. In lieu of legit French antiques, paint some thrifted finds with milk paint for a chippy finish. 3 – Feminine textiles – Fill the room with light colored and French inspired textiles. 4 – Linen fabrics – Linen is amaze. Add ruffles and you are golden. Or leave off the ruffles for textiles that will assist with the balance between masculine and feminine. Drop cloth curtains would also work great. 5 – Layer bedding and textiles – vary your throws and accent pillows to add dimension and texture to the space. 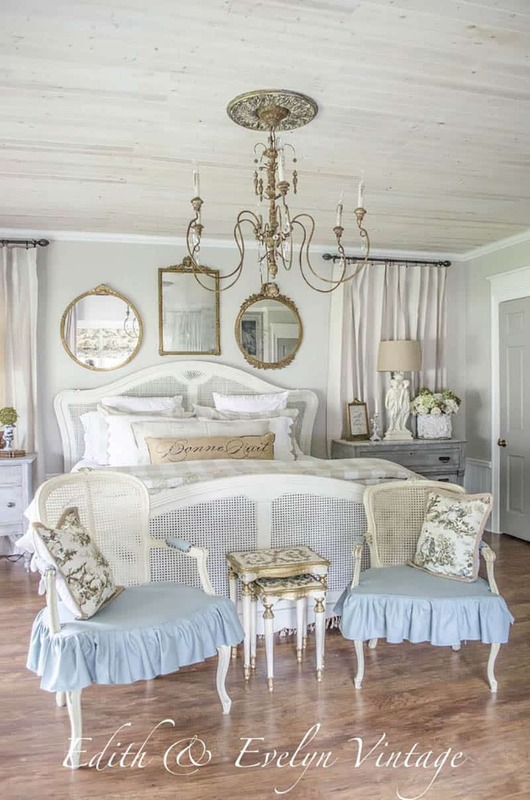 6 – Hang a chandelier – If you only do one thing to start transitioning your bedroom to a French look, choose this. A statement light fixture is one of the fastest ways (besides paint) to transform a room. 7 – Metallic accents – As shown in the inspiration photos, a little gold goes a long way. The lavish touch it adds can really bring your space to a new level. Note: some of the following links are affiliate links which allow me to earn a small commission if an item is purchased. Read more here.